When it comes to deciding on a new car, price isn’t everything. But it’s a big one. Almost everyone researches car online and even use an automaker’s website to configure a car with the options and features they want before going into the dealer. The problem is that some brands are a little bit sneaky about posting the total cost of their cars. 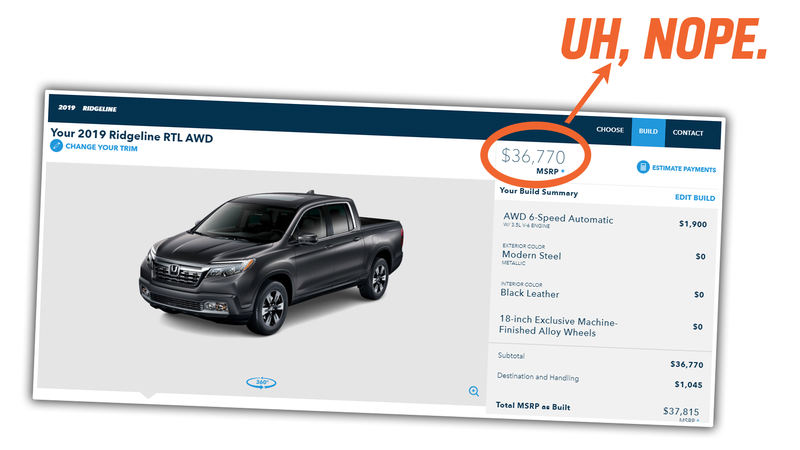 I got an email from a reader who was shopping for a Honda Ridgeline and was pretty convinced the dealer was giving them a bogus price because the MSRP on the quote was over $1,000 higher than the MSRP he saw on Honda’s website. The problem comes down to how the destination (or freight fee) is calculated into the total price. If you were to build up any Honda on the automaker’s webpage and click your options and trims you get a total in the upper right-hand corner. In the case of the Ridgeline RTL AWD, it is $36,670. However, it’s not until you go to the “summary page” and scroll all the way to the bottom do you see the real total including the $1,045 freight fee of $37,815. It used to not be this way. On Honda’s old configurator, before they started to get fancy with “tablet and mobile friendly” sites, when you clicked a car, the freight fee would automatically total up and the complete cost would be clear. Toyota has followed Honda’s lead and also gives the impression that the total cost is about $1,000 less until you go to the summary page. And Honda and Toyota aren’t nearly as bad as what Audi used to do. At one time the website would flat out omit the freight fee from their configurator entirely, relying on you to read some fine print to find out that the actual price of the car is really almost $1,000 higher than you expected. The domestic brands aren’t much better. They will post a “net price” that includes some of the current rebates at the time. Since these vary from month to month it can be even more confusing for a buyer. There is a better way. If I go to Hyundai’s website and select a 2019 Santa Fe Limited, on the tab it says $32,600, but on the top left corner, the “estimated total MSRP” is $33,645 including the freight fee. Nice and easy. I realize this may not be the biggest issue when it comes to car buying, but sometimes it’s the little things that bug us the most. And it’s such a simple fix that would reduce confusion and frustration for potential customers.